The Arctic hare is found in the northern regions of the Arctic Circle, predominantly in Northern America, Europe, Greenland and the North Pole. The Arctic hare has thick, white fur which allows it to continue inhabiting the Arctic regions successfully, in warmth and camouflage. The Arctic hare eats shoots, buds and berries found amongst the snow. The Arctic hare is a vital component in the Arctic circle food chain, being one of the few smaller mammals able to thrive in such a harsh environment. The Arctic hare is therefore common prey for bigger animals of the Arctic tundra, such as Arctic wolves, foxes and polar bears. 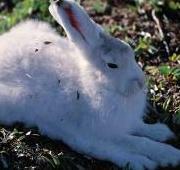 The Arctic hare is always white in the far north where there is snow all year round. 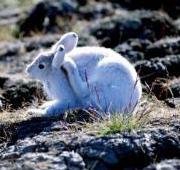 In parts of the Arctic circle that have seasons, the Arctic hare will go from white to a blue-grey color in the summer but is known to keep its white tail all year. The Arctic hare lives in groups of around 200 Arctic hare individuals. These large groups of Arctic hare will often work together to achieve what is needed for their survival as the Arctic hares huddle together to conserve heat and to keep them warm. The Arctic hare has long claws which helps the Arctic hare when digging through icy and snowy conditions when the Arctic hare is searching for food or if the Arctic hare is digging a den. 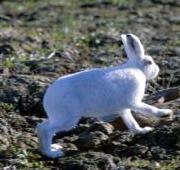 The Arctic hare can achieve very fast speeds when the Arctic hare feels threatened. 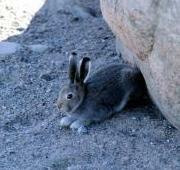 If the Arctic hare senses danger, the Arctic hare will stand on its hind legs and survey the area. If the Arctic hare feels threatened, the Arctic hare is capable of taking off at very fast speeds as the Arctic hare moves by hopping off its back legs in a similar way to a kangaroo. Lepus arcticus, or arctic hare, also known as polar rabbit, are a kind or specie of hare that is most likely to find in mountainous and polar habitat. Thick fur coat is the reason of survival of this animal in such harsh environment.